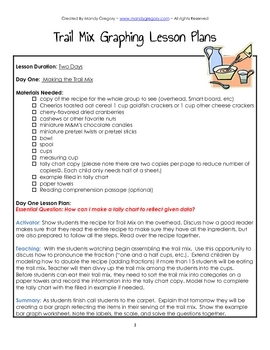 This 15 page booklet contains practice reading a recipe, creating and reading a bar graph with the teacher lesson plan included. 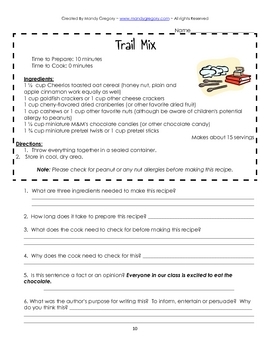 This two day lesson first has the teacher model reading and creating the recipe for trail mix, and then students tally the contents of their trail mix. 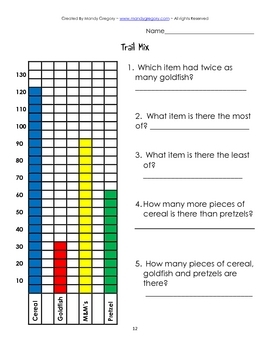 The second day the students then create a bar graph from the contents of their trail mix from the day before. 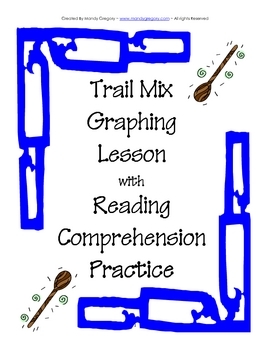 Also included are optional activities such as reading a bar graph (two copies- one for whole class model and another for independent student practice) and reading the trail mix recipe and answer reading comprehension questions about the recipe.